Most of us are responsible for paying our electricity bills. For many, these costs can be ridiculously high. According to the US Energy Information Administration census, the average monthly bill for residents in the US in 2011 (most recent study) was $110.14. This means that most households are spending around $1,321 in electricity costs per year. 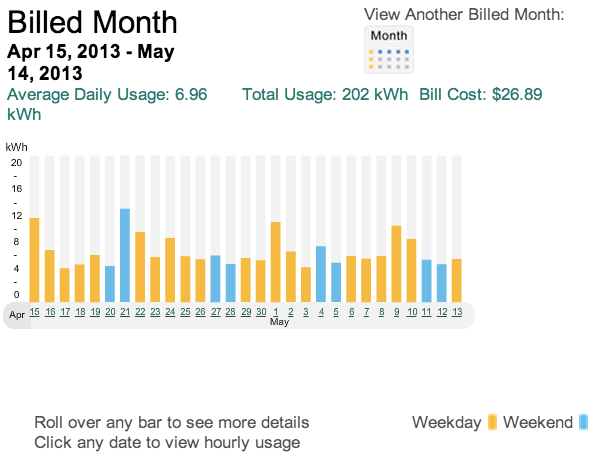 Our average electricity bill in our 2 story 2500+ ft2 home over the last 6 months has been $30.21 a month. 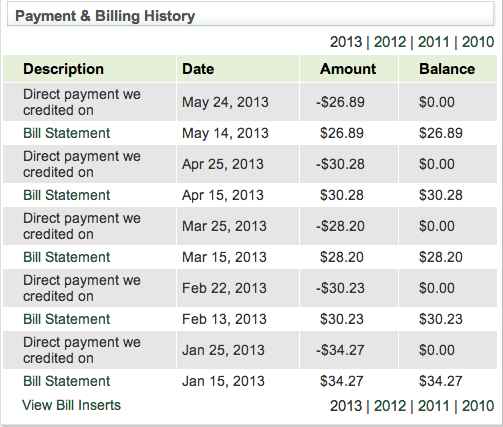 Our average electricity bill over the last year has been $35.09. Our most recent electricity bill was $26.89. This is awesome considering that we use electricity constantly at home. We do all our cooking with our electric oven and stove. Our laptops are always on (not charged only when necessary). We keep our refrigerator stocked with food. And we maintain a comfortable temperature in our home rarely using air conditioning. If we compare our electricity bill costs to the US Average, we are saving $75.05 a month. This amount compounded at 7% over 10 years will save us over $13,000! Lowering your electricity bill doesn’t require doing anything crazy. There is no need to buy a bunch of expensive energy saving products such as solar panels. There is no need light your home with candles. There is no need to buy an energy meter to measure exact electrical output. Making a few simple lifestyle changes and adjustments can dramatically lower your costs without much sacrifice. Here are my favorite easy suggestions for lowering your electricity bill. Use fans to properly move air around. A fan uses 50x less energy than an air conditioning unit. Fans don’t cool or heat the air, fans just move the air around. Heat rises and escapes out of the highest parts of your home, so you can use a fan to blow hot air out of the home at the highest-level overnight. Opening your windows at night helps to cool your home by flushing out heat and moisture that builds up during the day. This is really easy if you have a ceiling fan: run your fan counter-clockwise at higher speeds in the summer to move a breeze around. If you must use air conditioning, make sure all of your AC vents are open. This prevents overworking your air conditioning unit. Just remember that running your A/C for 4 hours a day can cost over $80 a month. We do laundry in our household about once every 1.5 weeks. Some clothing like dress shirts can be worn more than once before washing. More durable clothing like jeans can be worn several days before washing. Only use the cold water setting on your laundry machine. Cold water washes help your clothing maintain it’s colors so there is no need to wash light and dark colored clothing separately, reducing the amount of work you need to do. If you’re still washing your clothes with hot water, you are a chump. 90% of the energy consumed by your washing machine goes to heating water. Air-dry your clothing. This is taking it way back, old school. 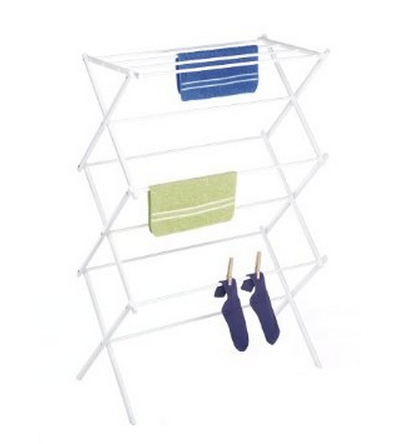 You can use a traditional clothesline or even a drying rack to get the job done. Because heat rises, let your clothes dry in the highest level of your home, or just use the power of the sun outdoors. We simply hang our clothes on our balcony / stairway railing. We don’t air dry everything. Hang drying socks and underwear can be a real inconvenience so we use the dryer for that. Speaking of using your dryer, try to leave 25% empty space to allow room for movement and efficient drying. Otherwise you are just overworking your dryer and it can take double the time to dry your clothes. We wash full loads with our washing machine and hang dry about 75% of our clothing. This way our dryer does not get over worked, and dries our small loads quite quickly! Use your major household appliances during off-peak hours. I called my electricity provider, Southern California Edison, and found out that off-peak hours for our location is between 6:00pm to 10:00pm. I’ve read that for other electricity service providers, off-peak hours start after 8:00pm so your results may vary. Electricity is charged at lower rates during off-peak times, so consider waiting to start your laundry, dish washer, vacuuming, etc until off-peak hours. Using heat-producing appliances like the dryer at night time will also prevent heating up the home during hot hours of the day. As you might have guessed, we only do our laundry and vacuuming during off-peak hours. 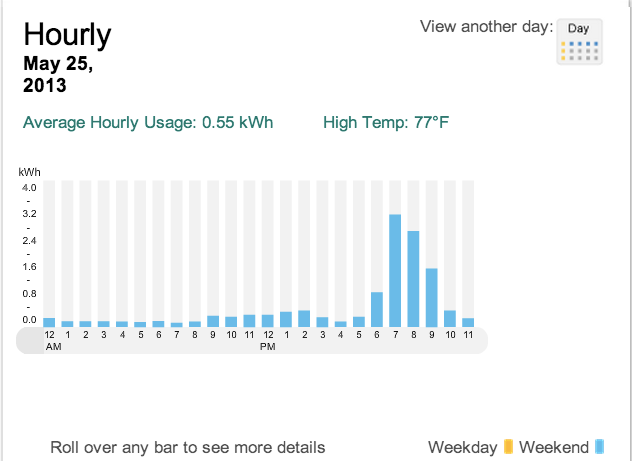 Here is an electric usage graph that Edison produced showing how we used electricity at home yesterday; notice how most energy consumption happened after 6:00pm. In the winter, you don’t want heat to escape, so you can use a fan to push heat down. If you have a ceiling fan, run it at clockwise at lower speeds in the winter to help trap and distribute the heat. We probably use our heater only a handful of times a year. When it’s cold at night, we just pile on extra blankets and cuddle. If we have to, we will use a portable space heater. There is really no point in turning on your heater overnight to heat the whole house when you only need your bedroom to be warm. Keeping unused appliances plugged in unnecessarily drains your electricity, up to 10% of your residential electricity use. Either unplug your unused appliances manually or simply turn off the power strip they are plugged into to reduce energy use. Turn off your desktop computer when you’re not using it. Unplug your laptop when you go to sleep. It doesn’t need all night to charge. You can also consider using an energy saving surge protector that automatically detects and shuts off unused electrical devices to help you save energy. We simply do it the old fashioned way by just unplugging unused appliances. Using energy efficient light bulbs really is a no brainer. Replacing your old incandescent lights with compact fluorescent bulbs can lower your energy costs substantially. Each compact fluorescent bulb will save you about $6 per year in electricity costs and over $40 over its lifetime. Each bulb uses about 75% less energy compared with your crappy old incandescent bulb and lasts at least 6 times longer. Also, each compact fluorescent bulb produces about 75% less heat, so it won’t unnecessarily heat up your home on hot days, further lowering the energy costs necessary to cool your home. Don’t forget to use and take advantage of natural light from the sun. When it’s bright outside, open your blinds and light up your rooms with natural sunlight. Studies find that your body needs about 5 to 30 minutes of sun exposure to your skin 2 to 3 times a week to help your body produce natural Vitamin D, which helps your body absorb calcium, increase bone density, helps with muscle function, and helps keep your immune system healthy. With these effortless tips, you should be able to cut down your energy costs considerably, and save an incredible amount of money along the way. Use the money saved for more useful and enjoyable purposes such as: contributing to your savings, investments, or travel fund.